Join us for the first homestand of the 2019 season! 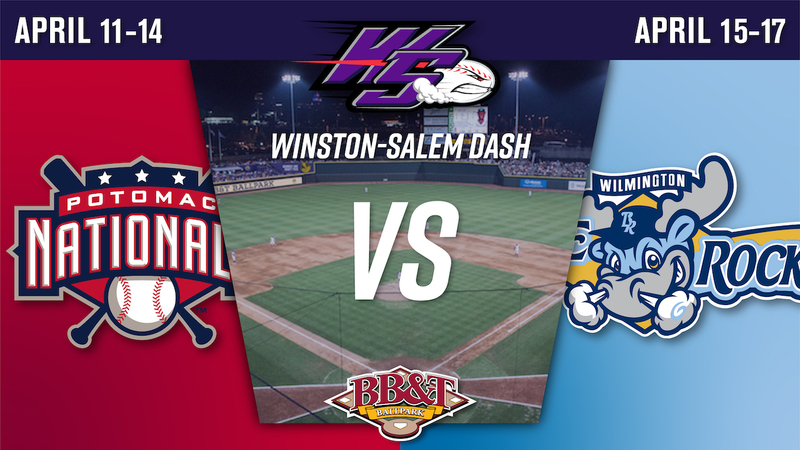 Fresh off a seven-game road trip, the Dash are home at BB&T Ballpark to begin the 10th anniversary season at the downtown facility with a seven-game homestand! Winston-Salem will host the Potomac Nationals for four games, followed by three games against the Wilmington Blue Rocks. The homestand will feature a Lowes Foods Thirsty Thursdays™ and Pups in the Park Night presented by Handy and Handy Orthodontics on Opening Night, a Fireworks Friday presented by PTI, Kids Run the Bases (powered by New Balance Winston-Salem), a Food Truck Festival and Latin American Jersey Day presented by Univision. Thursday, April 11: Dash vs. Potomac Nationals - 7 p.m.
Friday, April 12: Dash vs. Potomac Nationals - 7 p.m.
Saturday, April 13: Dash vs. Potomac Nationals - 6 p.m.
Sunday, April 14: Dash vs. Potomac Nationals - 2 p.m.
Monday, April 15: Dash vs. Wilmington Blue Rocks - 7 p.m.
Tuesday, April 16: Dash vs. Wilmington Blue Rocks - 7 p.m.
Wednesday, April 17: Dash vs. Wilmington Blue Rocks - 7 p.m.
LOWES FOODS THIRSTY THURSDAY: Presented by Lowes Foods, fans can enjoy select beers for $2 through the seventh inning on Opening Night. PUPS IN THE PARK, PRESENTED BY HANDY AND HANDY ORTHODONICS: Fans can bring their furry friends to the ballpark on Opening Night by purchasing a $5 pooch pass. Pups in the Park Night is presented by Handy and Handy Orthodontics each Thursday home game and will feature an appearance from Cooper the golden doodle. FIREWORKS FRIDAY, PRESENTED BY PTI: A spectacular fireworks display will follow Friday's game, brought to you by Piedmont Triad International Airport. KIDS RUN THE BASES, POWERED BY NEW BALANCE WINSTON-SALEM: Kids will have a chance to run the bases following the Friday, Saturday and Sunday games of the homestand thanks to New Balance of Winston-Salem. CHICK-FIL-A FOUR PACK NIGHT: The Dash and the Chick-fil-A at Thruway Shopping Center are teaming up to offer fans the best entertainment deal in the Triad. For as low as $32, fans will receive four tickets to the Saturday, April 13 game, along with four Dash hats and four Original Chicken Sandwich vouchers, redeemable at the Chick-fil-A at Thruway Shopping Center. This deal must be purchased in advance by calling (336) 714-2287. LIVE MUSIC SATURDAY: The Saturday, April 13 contest will feature a local band performing on the patio prior to the game. FOOD TRUCK FESTIVAL: The club will be hosting a Food Truck Festival prior to and during their 6 p.m. game on Saturday, April 13. Gates will open at 4 p.m. Lawn tickets purchased in advance are available for just $5. Prices will increase at the gate on the day of the event. A $25 VIP Ticket, which includes two drink vouchers, a Dash Mason Jar and 15-minute early access, is also available in advance of Saturday's game. LATIN AMERICAN JERSEY DAY PRESENTED BY UNIVISION: The Dash will be celebrating their local Latin American community again this season by wearing Rayados jerseys as part of Minor League Baseball's "Copa de la Diversión", or "Fun Cup," initiative; "Rayados", which translates to "the Striped Ones," is born out of collaboration with the baseball team and the Hispanic League of Winston-Salem. The team will wear the Rayados jerseys on Sunday, April 14. CRAFT FAIR: The Dash are hosting a Craft Fair before and during the game on Sunday, April 14. that will feature regional vendors selling handmade arts & crafts, antiques and food items! FREE FOOD MONDAY: Fans can enjoy free hot dogs and french fries until 8:30 p.m...for FREE! Also, corn dogs on those dates will also be available for free while supplies last. Normal ticket prices apply. HOCKEY NIGHT, PRESENTED BY THE CAROLINA THUNDERBIRDS: Wear your favorite hockey team's gear to the ballpark on Monday, April 15. TACO TUESDAY: The Dash will be serving $2 tacos through 8:30 p.m. on Tuesday, April 16. WINSTON WEDNESDAY: To celebrate the Twin City, $10 presale tickets are available for Wednesday, April 17. This deal must be purchased in advance by calling (336) 714-2287. WARTHOGS DAY: In honor of their former moniker, the Dash will sport Warthogs jerseys as part of their Winston Wednesday celebration! The Dash have unveiled new traffic plans for the 2019 season, which are availablehere. All parking at Dash-controlled lots will be $7 during the 2019 season. BROADCAST INFORMATION: All seven games of the homestand are available at wsdash.com/broadcast, the TuneIn Radio App and MiLB.tv. Meanwhile, Thursday's home opener will be broadcasted on The Sports Hub Triad (101.5 FM and 600 AM locally in Winston-Salem.